Baixa Pombalina, or, more simply put, Baixa, is a district of Lisbon and one of the most popular even, at least from a tourist point of view. The prestige of Baixa does not lie exclusively in its tourist reputation, but also in the fact it is one of the first and most faultless earthquake-resistant urban planning and construction examples in Europe. Indeed, the Baixa district was completely renovated after the massive cataclysmic incident in 1755 (earthquake, tsunami and fire), and it is to the first Marquis of Pombal (from where the name “Pombalina” derives), Sebastiao Jose de Carvalho e Melo, that Baixa owes much of its present look and patrimony. The district enjoys a virtually central location, extending between the Tagus River and the Liberty Avenue (Avenida da Liberdade), neighboring at the same time on the Alfama district. It is replete with architectural marvels and aesthetically pleasing sets, being deemed the most elegant of all districts in Lisbon. Baixa is simultaneously the shopping and banking district of the city, but the bottom line is it stands out as one of the highest rated tourist hotspots in the capital of Portugal. Thus, for instance, tourists can explore at leisure the pedestrianized streets of Baixa (Rua Augusta being, from this point of view, a climax of all pedestrian thoroughfares in Lisbon, pegged out by the namesake monumental triumphal arch) and its majestic squares and relax while discovering the shopping opportunities and the plethora of cafes scattered throughout the district. Tourists can also delight in admiring some of the best examples of neo-classical and Art Deco buildings in Lisbon, since, indeed, Baixa is nothing but a bundle of architectural gems, and shopping and sightseeing opportunities. 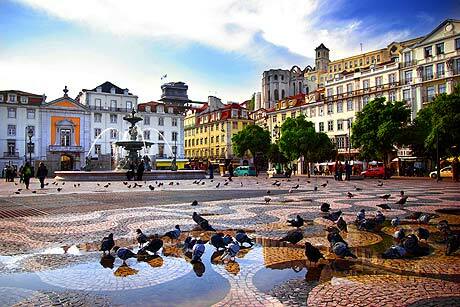 Specifically, tourists can stroll around Praca do Comercio and take a look at Arco da Rua Augusta and at the statue of King Jose I on horseback, and then head for the Rossio Square which is overtopped by the statue of Dom Pedro IV and flanked by the Rossio Train Station and by the Dona Maria II National Theater. Just next to Rossio there is Praca da Figueira, from where tourists can admire from a distance the ancient Castle of Saint George. Praca dos Restauradores is also nearby, with its imposing obelisk and with the neighboring Elevador da Gloria, whereas Praca do Marques de Pombal is, it too, a must-visit, given it is home to a monument erected in the honor of he who had the initiative of reconstructed the entire Baixa district. Visitors should also keep in mind the Municipal Square, which is where the City Hall of Lisbon is located, and the Church of Sao Domingos are also well worth a visit. They can complete their experience of the elegant Baixa district by relaxing in the Eduardo VII Park, the largest park of Lisbon.